When I was a lad, I loved color. Educational school supplies like crayons and magic markers in particular were my favorite. The magic markers that smelled like fruits were really cool because they reinforced both the color and the flavor that that color was associated with. Plus, who wouldn’t want to use sweet-smelling markers to color and explore a world of creativity? Crayons are also great for kids. The 24 pack box was great to carry around – it had everything you needed, and didn’t leave you desiring anything else. 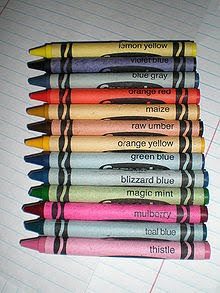 Reading all the names of the colors helped me understand a more literary aspect – magic mint, blizzard blue, raw umber. Even though we didn’t know why that pink crayon was called thistle, it still led us to think and imagine, maybe even ask questions, and introduced us to new words and pronunciations. Then the actual drawing. Coloring books were never my favorite. It’s easy to color in the lines if you take the time. It’s when you move outside of what’s given to you and create your own designs that you really experience pleasure. Kids need to be encouraged to play with educational school supplies, and it shouldn’t be made to be a chore. The more your children enjoy playing with back to school supplies the more they will get out of the creative experience. Additionally, you can make him look for the instrument. Anyway, what a cute and body and soul buddy.